Going to the American Speech Language and Hearing Association (ASHA) convention can be a little overwhelming. It sure was for me the first time I went (and the second time too); I felt pretty alone. I had no idea what classes to take, what to wear, what to bring or who I would talk to. Fast forward five years to now, when I’m lucky enough to be going again for the fourth time (San Diego, Chicago, Denver and now Philadelphia). 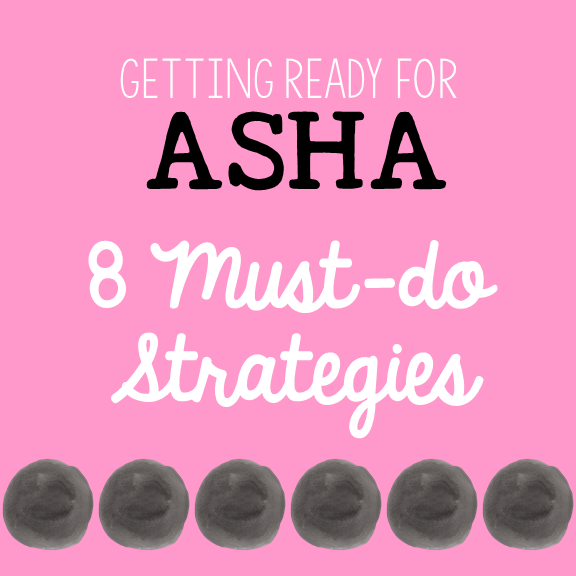 It’s the perfect time to share this list of must-do tips for successfully navigating the ASHA convention. You’ll want to go through the pocket planner or the program guide several times. Here’s a little video on how I do it. Besides your area of interest, it’s always good to choose one course that will challenge you or is something you wouldn’t normally take. Because it’s good to just shake things up. I got this idea from Activity Taylor blogger, Kim Lewis. Now I do this every year. Several of the school SLP bloggers are presenting this year; I put together a Here’s a list of the ones I know about. You’ll definitely want to consider these. You’re going to want to get to your classes a little early. This is super challenging for me since I tend to run about five minutes late for everything. But some of the sessions are really crowded;if it’s a two hour session, you’re going to want to be comfortable. Seating is limited as well. So get there 20-30 minutes early, then maybe someone will save your seat so you can go grab a cup of coffee. Everyone is super nice (of course). Plan ahead for your lunches. If you have back to back courses it’s pretty tricky to leave the convention center and get back on time. Because, let’s face it, everyone’s got to eat, so the restaurants get really crowded. I usually do a combination of the ASHA prepaid lunches and snacks. Keep some snacks in your purse. If you’re like me you’ll need them to keep your energy up. Nuts, trailmix, and protein bars are all great. (Okay, add a little chocolate to keep things interesting). Really consider your footwear. You’re going to be walking a lot. My choice: boots and booties. I love boots and they’re great for walking around. (And they’ll be warm for this Arizona girl). Of course, you can dress however you want. Remember you’re going to be sitting a lot, so you want to be comfortable. But you’re going to want to look professional too, (at least I do). It looks like a coat will be in order for this year’s Philadelphia location (Weather forecast highs in the 50s, lows in the 30s). I definitely recommend using the coat check instead of hauling your coat with you all day. I plan to dress in layers, because you never know what the temperature’s going to be like in each room. There’s nothing worse than trying to concentrate when you’re freezing or roasting. The first few times, it can be a little overwhelming because it’s HUGE. Get the floor plan that comes with your registration packet and have a look. Does that sound geeky? I just remember my first time. I didn’t have a plan and I ended up getting completely overwhelmed and exhausted. So last year, in Denver I did it differently. I went through the floor plan and highlighted all of the booths I knew I wanted to go to. Then I made sure I went to those first. I also scheduled myself a nice block of time to look at things. All the things! Remember, if you only go at the end of the day, after you’ve taken all those courses, you might just be a little brain-dead. This is a great opportunity to check out some of the big vendor’s booths. There’s always tons of swag. Super Duper has a huge area (it’s like a store), where you can actually purchase therapy materials. They also give you a big huge tote bag to carry everything in. Again, plan ahead, you don’t want to be caring that huge bag with you all day to all your classes. Be sure to go visit my SLP Blogger friends at their booths. You can learn more about their products, say hello, get more SLP swag, and sign up for prize giveawys. Marisha McGrorty Lesson Plan Membership Booth 743. I have one last tip for you. Reach out to some of the SLPs that you know from social media. Maybe you can meet up with one or two of them. I’ve made some great friends that way. One of the best things about going to an ASHA convention is connecting. We all work so hard, it’s nice to have time to socialize with people who speak our language. That’s all for now. I hope you find these tips helpful and I would love to see you in Philadelphia! I’ll be posting on Instagram (Beautiful Speech Life) and maybe even Facebook Live. If you want more informative SLP info, tips and freebies join the tribe by signing up below. ASHA sounds like so much fun this year! Wish I could go, but not for me, too far from CA and it’s our conference week at school, so not good timing either. See if you can attend the course that Erik X. Raj is doing with Scott Yaruss–that will be amazing, because both of them are amazing! So glad you are going to see Felice and Rachel–they are CA girls and I know them! I also know the SLP Toolkit ladies, and they are fantastic–it is my favorite tool that I use daily and it makes my life so much easier and progress reports, testing and IEPs are so much more manageable because of it (will never say ‘easy’ about those things!). Have fun and post about your experience so we can live virtually through you! Good suggestions Judy! I haven’t met Rachel yet, this time hopefully. Yes I agree, I love SLP Toolkit as well; such an amazing tool for the school SLP. Great suggestions Anne! I hope to run into you there! That would be great Dean! Great suggestions Anne! I LOVE ASHA conventions. They can certainly be a bit overwhelming but the energy of that many SLPs in he same venue at the same time is truly energizing. I always feel like I can’t me back to work re-energized, ready to take on the world. I like to have a backup for sessions too incase they aren’t what I had interpreted them to be when I get there. Thank you for including me on your list. I am looking forward to seeing you again! Yikes, auto correct! Not “can’t me back”, come back! Ugh. Me too…they are inspiring and I love making connections. Such a great tribe we have. Looking forward to seeing you too!